Toronto Cello School was founded by well-known Russian cellist Oleg Volkov to provide the highest standards of string instruments playing for students of all ages. In Toronto Cello School you can learn to play cello at the highest level. We also teach violin and viola; give piano lessons for beginners and music theory lessons and provide our students with excellent performance opportunities. SPECIAL DISCOUNTS FOR NEW STUDENTS! The Festival is also happy to announce a new cello award, the 2011 Zara Nelsova Memorial Award for Canadian Cellists, for cellists aged between 22 and 32. Ofra Harnoy has established herself as one of the greatest cellists on today's concert stage. She is one of Canada's most celebrated personalities and was recently appointed to the Order of Canada by Canada 's Governor General. By joining the international artists roster of RCA Victor Red Seal in 1987, Ms. Harnoy became the first Canadian since Glenn Gould to gain an exclusive worldwide contract with a major record label. Ofra Harnoy was born is Israel and immigrated to Canada at age 6. She studied with William Pleeth in London, Vladimir Orloff in Toronto, and participated in master classes with Mstislav Rostropovich, Pierre Fournier and Jacqueline du Pre. One of the most exciting solo artists of his generation, JOSEPH JOHNSON is currently the principal cellist of the Milwaukee Symphony Orchestra and principal cellist-designate of the Toronto Symphony Orchestra, a post he takes up at the start of the 2010-2011 season. 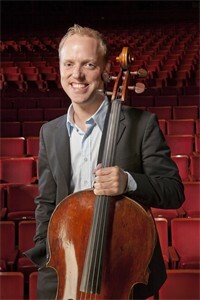 He continues as principal cellist of the Santa Fe Opera, and, during the 2008-2009 season, served as guest principal cellist of the Honolulu Symphony Orchestra. Gartxot was born in Pamplona and began playing the cello as a youngster at the age of 9. Besides his musical career, he reigns in the kitchen of his own restaurant, in his hometown. He toured around Spain for a while in a chamber-music group, until he left behind band and restaurant to start a new phase in Madrid. He's dedicated himself to teaching music to children in various schools and working as a musician in the Compañía Nacional de Teatro Clásico (The National Classical Theater Company). Alex Volkov (violin) and Oleg Volkov (cello) will perform works by Beethoven and Mozart with the Cathedral Bluffs Symphony Orchestra. Alexander Kniazev was born in Moscow in 1961. 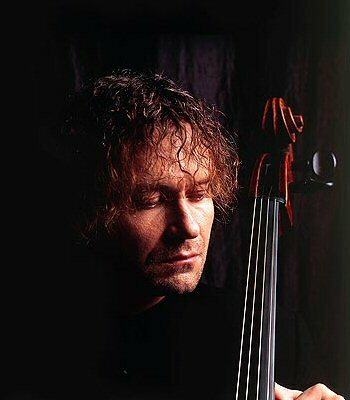 He began his cello studies at the age of six with Alexander Fedorchenko and graduated from the Moscow Conservatory in 1986. He then went on to study with the renowned organist Galina Kozlova and graduated from Nizhny-Novgorod Conservatory as an organist in 1991. Alexander Kniazev is a laureate of the National Cello Competition in Vilnius (1977), the International Cello Competition in Cassado (1979), the Chamber Music Competition in Trapani (1987) with the pianist Ekaterina Voskressenskaya, the International Tchaïkovsky Competition in Moscow (1990) and the UNISA Competition in Pretoria (1992). He has appeared with such distinguished conductors as Evgeny Svetlanov, Yuri Temirkanov, Mstislav Rostropovitch, Vladimir Fedoseyev, Yuri Bashmet, Maxim Shostakovitch and Neemi Jarvi. His chamber music partners include Vadim Repin, Nikolai Lugansky, Viktor Tretyakov, Boris Berezovsky, Dmitry Makhtin, Brigitte Engerer, Laurent Korcia, Augustin Dumay and Maria-Joao Pires. As well as performing, he teaches at the Moscow Conservatory and regularly gives master classes in Europe and Asia. Copyright © Toronto Cello School. All rights reserved. * The content of this website is for your general information and use only. It is subject to change without notice. * Neither we nor any third parties provide any warranty or guarantee as to the accuracy, timeliness, performance, completeness or suitability of the information and materials found or offered on this website for any particular purpose. You acknowledge that such information and materials may contain inaccuracies or errors and we expressly exclude liability for any such inaccuracies or errors to the fullest extent permitted by law. * Your use of any information or materials on this website is entirely at your own risk, for which we shall not be liable. It shall be your own responsibility to ensure that any information available through this website meet your specific requirements. * This website includes materials from other websites and links to those websites. These links are provided for your convenience to provide further information. They do not signify that we endorse the websites. We have no responsibility for the content of the linked websites and for the content we borrowed to be published on our website. * We are not associated with artists or companies mentioned on the site and that we acknowledge that names, products and imaged mentioned or displayed on this site are trademarks of their respected owners.